A family's trip to a trampoline centre went horribly wrong when a mum broke both ankles at the bottom of a vertical slide. Nikitta Cole had taken her three children to the new Flip Out in Manchester when the incident happened last week. After watching her son go on the 20ft Ninja slide she decided to have a go herself. But she didn't slow down at the bottom and crashed into the barrier feet first, breaking both ankles. Nikitta, mum to Declan, 11, Maisy-Lea, nine, and Alleah-Jae, two, was initially unaware of the damage she'd done. She told the M.E.N: "At first I was just in shock and I went completely numb. I didn't realise what had just happened. "I had three pairs of socks on so I didn't say anything until I asked if they would be able to take them off as after a few minutes I realised the pressure in my legs wasn't normal. 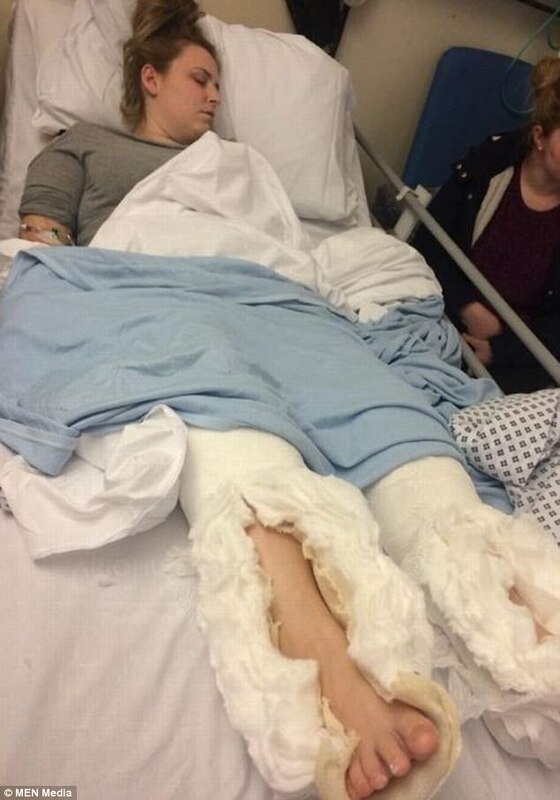 "I have never had a broken bone in my body so didn't realise they were broken." Nikitta, who works at McDonald's in Pendlebury, had a three-hour wait for an ambulance but was then told she'd have to make her own way to hospital, which she did in a taxi. Once at Salford Royal an X-ray eventually showed she had broken both ankles and she needed surgery to fit metal plates and screws which will now be permanent. Nikitta has since praised the staff who helped her at the centre, staying behind late until her taxi came. She said: "They were brilliant with me when it happened. The centre closed at 9pm but the staff stayed with me gone 11pm until my taxi had arrived and helped manoeuvre me into the taxi. "I'm concentrating on getting back on my feet. I'm still bed bound and very swollen after surgery and just want to get back to being a mum to my children." Asked whether she is planning on making a formal complaint or taking action against the centre, Nikitta said she'd not had time to consider it. She said: "I'm going to be off work and it's going to be a long recovery as I work on my feet. "The children are all over the show at the minute being passed about between family and friends due to their father working full time. He is taking some time off to try his hardest to help." Flip Out opened inside a 35,000 sq ft site at Sportcity, near the Etihad Stadium, in December, featuring wall-to-wall trampolines as well as a Ninja Warrior-style obstacle course with climbs and towers to race up, a lazer maze to navigate and the 20ft slide. A spokesperson for Flip Out Manchester said: "Since opening at the end of December thousands of people have safely used the slide and we are confident this is an isolated incident. “Safety is our number one priority and we strive to ensure that everyone who visits can enjoy all of the activities in a safe environment.